The Circle Orboros is arguably humanity’s most ancient organization. This cabal of powerful mystics who call themselves druids predates all the civilizations presently dominating western Immoren. For thousands of years druids have gathered in secret to master control over nature and to wield that power as both a formidable weapon and a versatile tool. They are a pseudo-religious organization that draws their strength from an entity they call Orboros, a philosophical idea inextricably connected to the Devourer Wurm. Orboros manifests in the raging storm, the sizzle of lightning, the roar of thunder, the unrelenting power of flood, and the hunger that drives all predatory beasts to stalk their prey relentlessly. Druids can call on all these primal forces and bend them to their will. Druids are not chosen or recruited but rather are born with the power to call on nature. This is called the “wilding” and manifests in young children as a type of madness. They begin to flee into the wilderness at night, howling incoherently or emulating the beasts of the wilds. Such odd children are often shunned or even cast out by their own families, but the druids have ways to find and collect them, training them to unleash and control their inner power. After years of this work these druids earn their place in this ancient hierarchy, an organization that prizes power, cunning, intelligence, and the ability to manipulate lesser creatures. 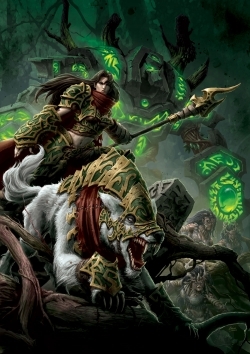 Druids such as Krueger the Stormwrath, Mohsar the Desertwalker, and Morvahna the Autumnblade lead the Circle Orboros, which has stepped from the fringes to join battle against those enemies who would despoil their sacred circles or whose mere existence defiles Orboros. Civilization is their enemy, but so are the blighted dragons, the invading skorne, and even the Trollbloods who were once allied with them. Druids are relatively few in number, but they wield a potentially boundless power. Over the centuries these mystics have gathered or manipulated others into joining their cause and fighting their battles for them. This includes a large group of loosely organized warriors and mercenaries called the Wolves of Orboros, along with the tribal and bloodthirsty Tharn, hulking cannibals who worship the Devourer Wurm and who can transform their bodies to become ultimate predators. Many great beasts of the wilds are at the beck and call of the druids and their allies, including savage warpwolves, protective but fierce goat-like satyrs, enraged gorax, two-headed argus, and more. Some druids, like Baldur the Stonecleaver, specialize in the mastery of ancient rituals enabling them to bring stone-and-wood constructs to life. These great wolds are shaped by chisel, axe, and a druid’s power to become towering weapons of war, in many respects the equal of the warjacks created by the armies of the “civilized” nations.